Japan and Okinawa provides an up-to-date, coherent and theoretically informed examination of Okinawa from the perspective of political economy and society. 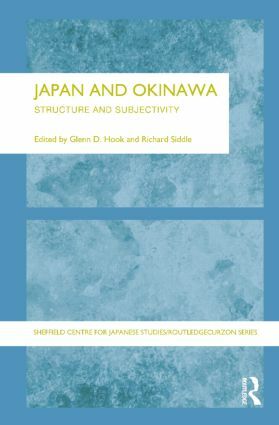 It combines a focus on structure and subjectivity as a way to analyze Okinawa, Okinawans and their relationship with global, regional and national structures. The book draws on a range of disciplines to provide new insights into both the contemporary and historical place of Okinawa and the Okinawans. The first half of the book examines Okinawa as part of the global, regional and national structures which impose constraints as well as offer opportunities to Okinawa. Leading specialists examine in detail topics such as Okinawa as a frontier region, Okinawa's Free Trade Zones and response to globalization, and Okinawa as part of the Japanese 'construction state', being particularly concerned with how Okinawa can chart its own course. The second half focuses on questions of identity and subjectivity, examining the multitude of vibrant cultural practices that breathe life into the meaning of being Okinawan and inform their social and political responses to structural constraints. The originality of this book can be found in its elucidation of how the structural constraints of Okinawa's precarious position in the world, the region and as part of Japan impact on subjectivity. For many Okinawans, in the past as now, acceptance and rationalization of their dependency has made them collaborators in their own subordination. At the same time, however, they have demonstrated a capacity to give voice to a separate identity, inscribing cultural practices marking them as different from mainland Japanese. Glenn D. Hook is Professor of Japanese Studies and Director, Graduate School of East Asian Studies at the University of Sheffield, UK. He is affiliated with the University of Tokyo as Foundation Visiting Professor of International Politics in the Graduate School of Law and Politics. His publications include Militarization and Demilitarization in Contemporary Japan, Japan's Contested Constitution. Documents and Analysis, and Japan's International Relations: Politics, Economics, and Security. Richard Siddle is Lecturer in Japanese studies, School of East Asian Studies, University of Sheffield. In 1996-7 he was a Japan Society for the Promotion of Science Postoctoral Fellow at the University of the Ryukyus. He is the author of Race, Resistance and the Ainu of Japan and various articles on Okinawa and the Ainu.